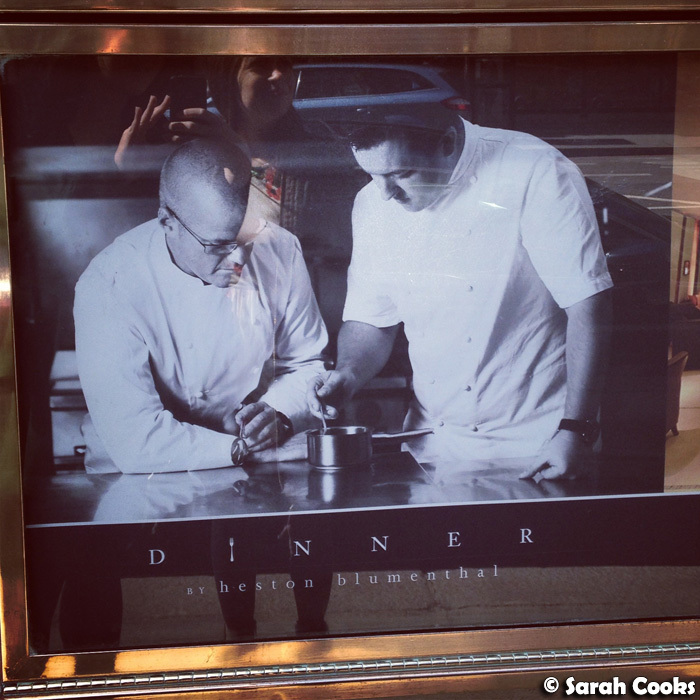 Next stop on our London Weekend of Eating - after breakfast at Ottolenghi, and an appetite-inducing walk through Borough Market - was lunch at Dinner by Heston Blumenthal. Months ago, when I was in pre-trip planning mode, I had thought of making a trip to The Fat Duck, but apparently, if you have dinner there, you have to stay the night in Bray, as the trains back to London finish earlier than the tasting menu does! (A clever move by the Bray tourism commission, perhaps?) 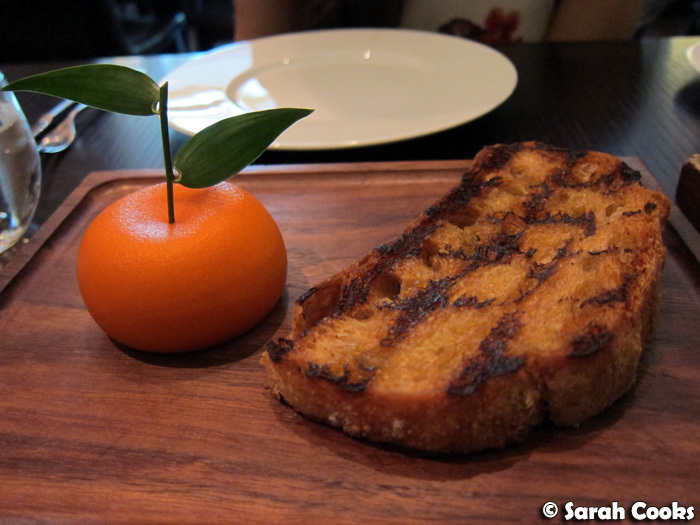 My trip to Germany was already quite short, and taking five days out for London and Paris was already a bit of a stretch, so I canned the idea of The Fat Duck, and chose Heston's more casual restaurant, Dinner, instead - right in the heart of London! As a bonus, my dad generously offered to shout my meal too - thank-you Dad!! On the plane from Melbourne, the in-flight entertainment system happened to have How to Cook Like Heston available! I watched the episodes: "Chocolate", "Cheese", and "Potatoes" - and totally drooled over his famous triple-cooked chips! I could not wait to try them for myself! 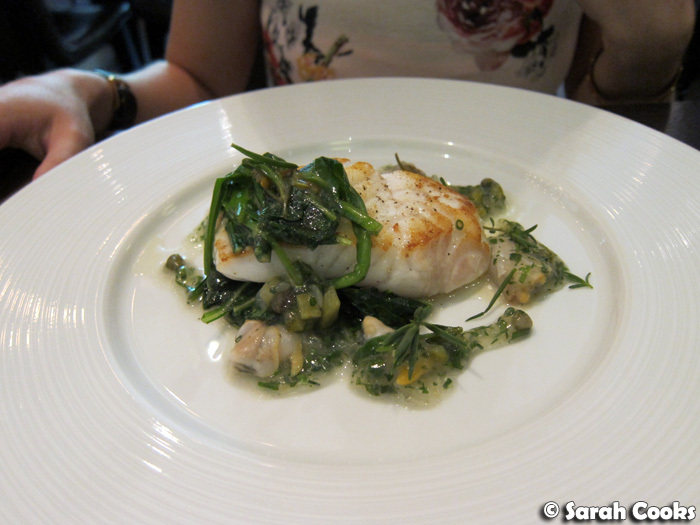 Dinner is located in the rather upmarket Mandarin Oriental Hotel in Knightsbridge, but the restaurant itself doesn't feel stuffy at all. In fact, the stated dress code is: "comfortable", and most people seemed to opt for smart-casual. Clarice and I found all the waitstaff to be well-presented and professional, but still warm and friendly. We also appreciated the whimsical touches around the dining area. 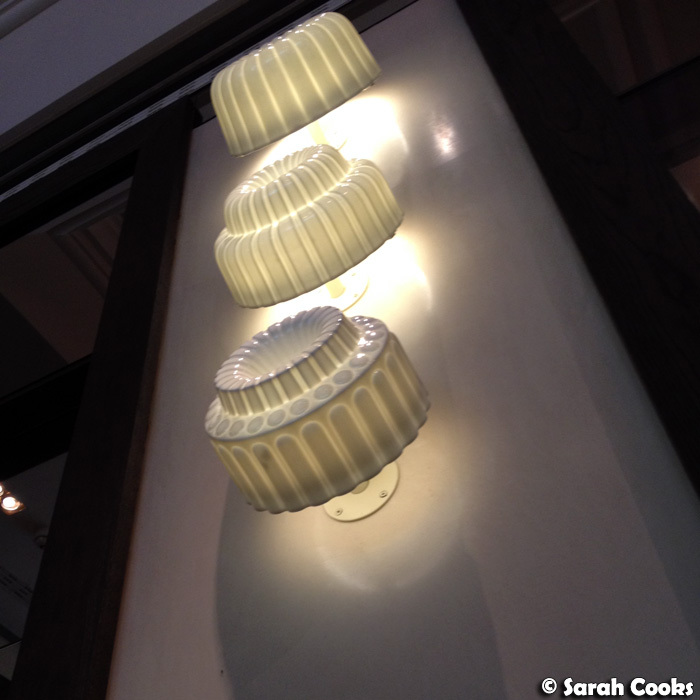 Look - jelly mould lamps! We decided to share an entrée, so that we'd have enough room for a dessert each. Priorities! 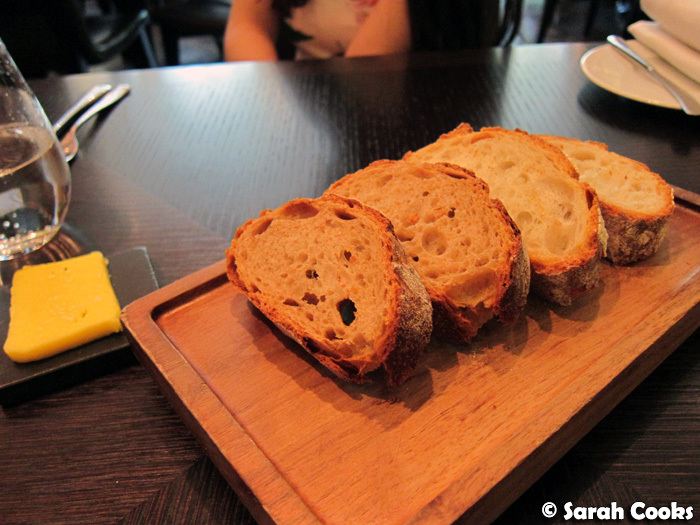 We started with some house-made bread, served warm with delicious salted butter. The bread was sourdough, crusty on the outside, and wonderfully chewy on the inside. We only had one slice each to begin, as we didn't want to fill up, and thought that we might want to save some bread for our entrée... the famous Meat Fruit! 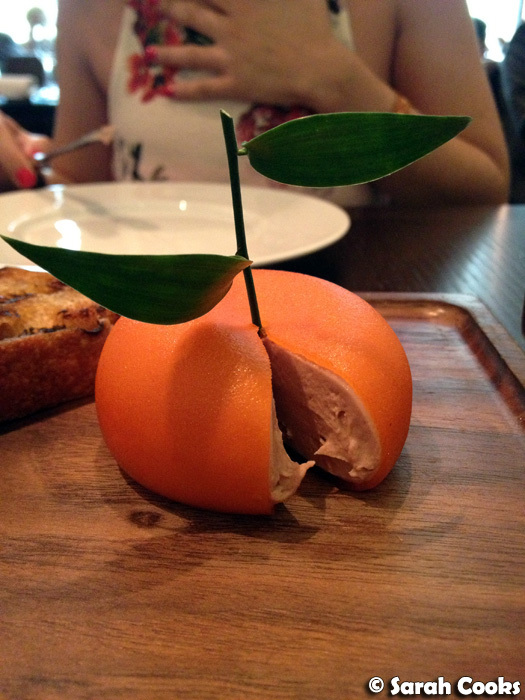 I'm sure you've read about this before, but essentially, the Meat Fruit is a chicken liver and foie gras parfait, encased in a thin mandarin jelly, carefully textured and moulded to look like a real mandarin. So cute! 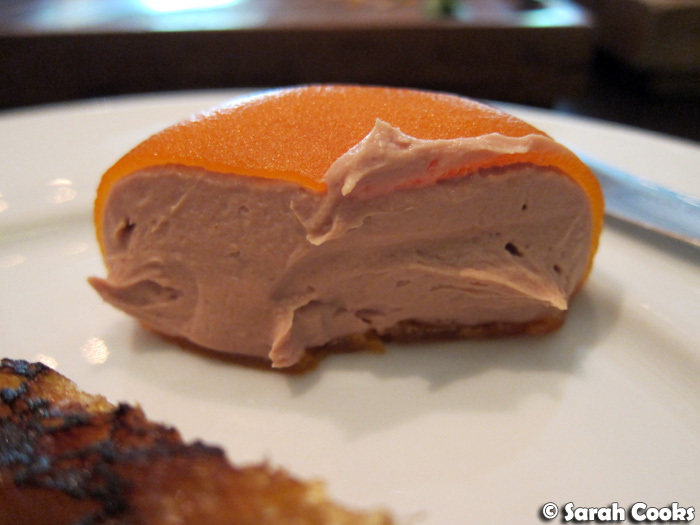 The parfait was so incredibly smooth and light in texture, its richness offset by the tart and sweet mandarin jelly. 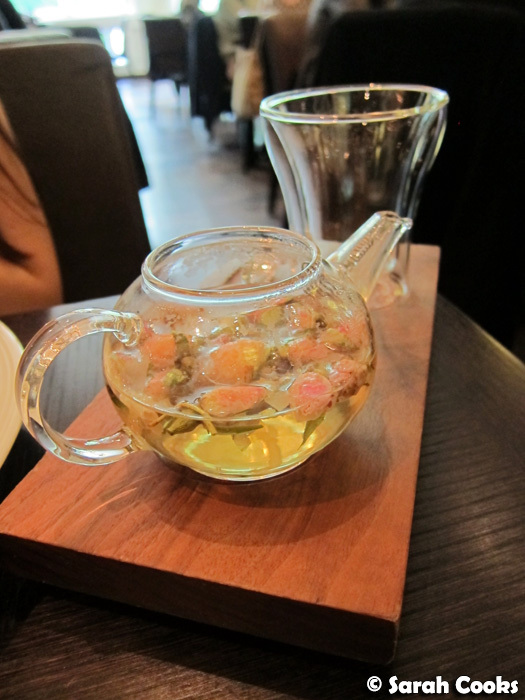 It was such a treat, and I'd definitely recommend ordering this if you visit Dinner! The slightly smoky, crisp chargrilled bread complimented the parfait perfectly - we just wished there was slightly more of it. Luckily we hadn't eaten all of our bread, so once the chargrilled bread was gone, we just moved onto the normal bread. While we're on the topic of the Meat Fruit, let me tell you about the decidedly disinterested couple who happened to be sitting next to us at the restaurant. 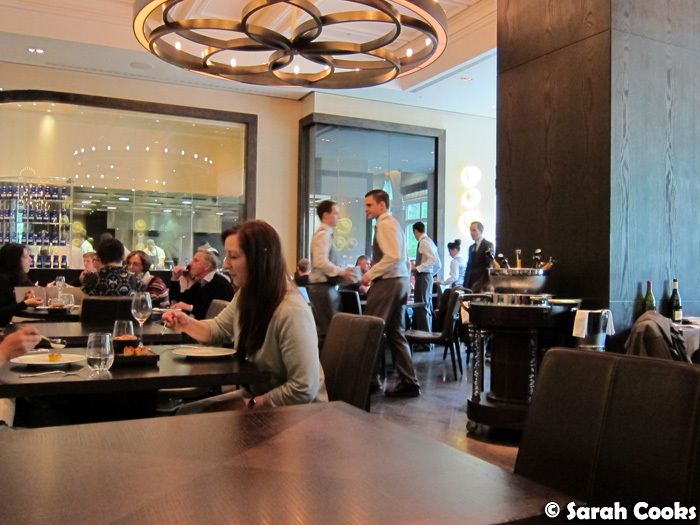 (You may remember that we sat next to a similarly disinterested customer at Ottolenghi!) While Clarice and I were thrilled that we'd secured a table, having booked weeks in advance, and were marvelling at the incredible construction of the Meat Fruit, the young Malaysian-Chinese (like me!) couple next to us looked like they were about to fall asleep. They had been sharing a perfect-looking bone-in rib of Hereford prime beef with triple cooked chips, had gotten through half of it, and were just poking disinterestedly the remaining half with their forks, not talking to each other, and not seeming to care that there was a totally amazing meal sitting in front of them. They got desserts too, but didn't seem to care about them either. In fact, the most animated they got was when they asked a waiter to take a photo of them. Oh well, who am I to judge - people get tired, get full, aren't as food obsessed as my friends and I are. (And there I was thinking that all Malaysians are obsessed with food!) I just thought it was a very funny contrast to our enthusiasm! 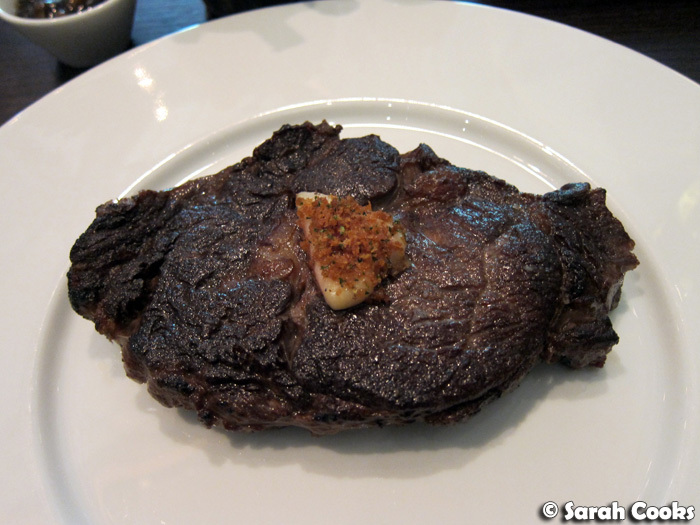 The steak came with a mushroom ketchup, a jus and the triple-cooked chips. 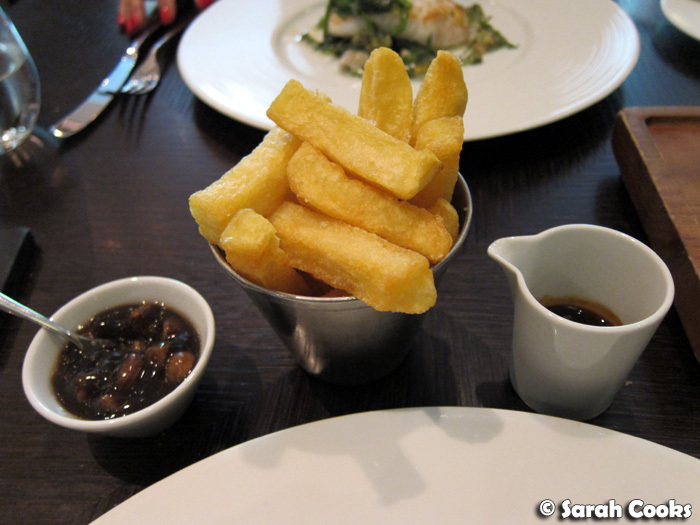 On reflection, given that we were at a Heston Blumenthal restaurant, I feel like I could have ordered something a little more adventurous than a ribeye steak - but there was no way I was missing out on those chips! I must say I preferred the jus to the mushroom ketchup, although having said that, the steak didn't really need any extra adornments. Those of you who've been following me for a while will know that I have a weakness for fat soggy chips, and can't stand thin crispy French fries. (Where is the stodge?) 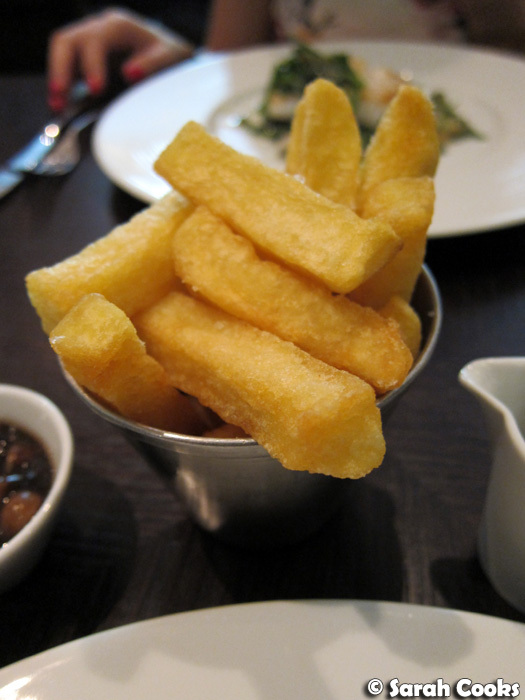 These triple-cooked chips, however, had the best of both worlds. They were cut thickly enough that there was a generous amount of fluffy innards, but were cooked so well that they had a lovely crisp coating. Result! Dessert! While we're here, let me take a moment to say that I found the ye olde British names of the dishes (with historical dates for reference) on the menu quite charming. As you can see in my blog's sidebar, one of my current culinary passions is traditional British food, so I found this all very fascinating! 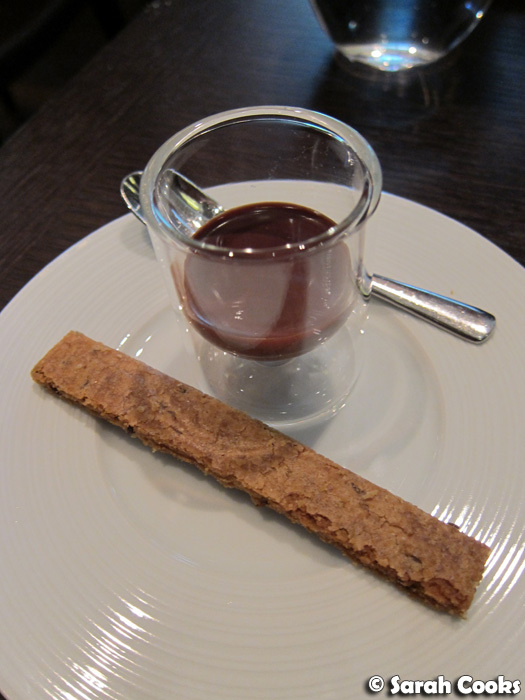 The quaking pudding was like a cinnamon-scented, very softly-set panna cotta. It looked so lovely! And tasted just as good. 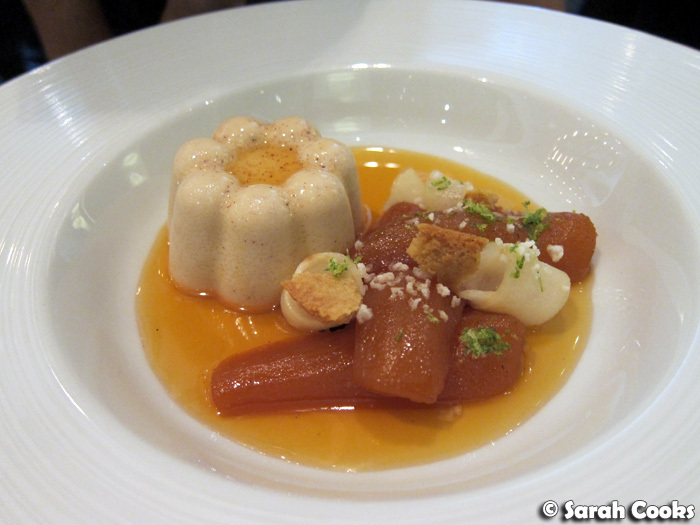 I loved the shape of the pudding - it looks like the jelly moulds my mum used to use when I was little. 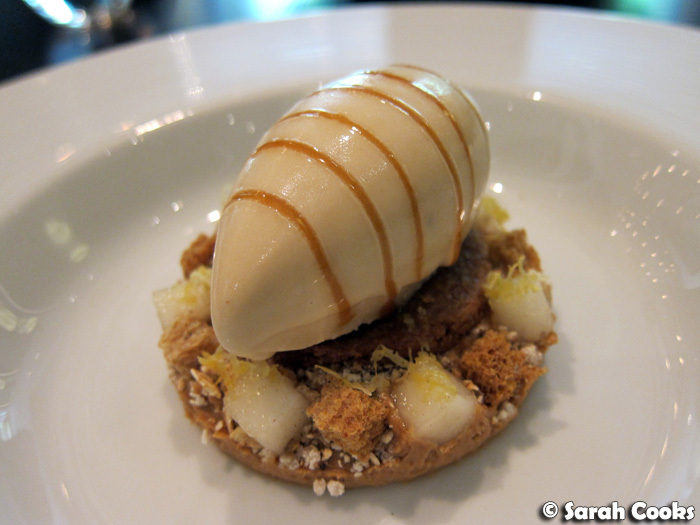 I saw salted caramel, I immediately went for the brown bread ice-cream. It was so beautiful! 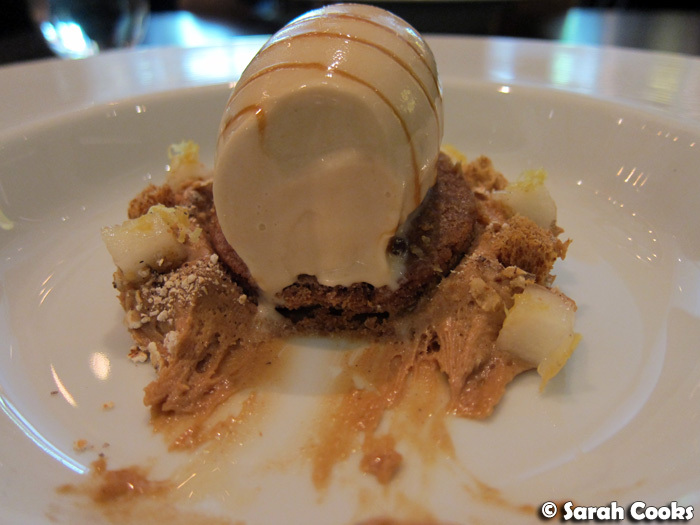 I loved the perfect quenelle of brown bread ice-cream, sitting atop what looked like a digestive biscuit, surrounded by pretty squares of pear and what I believe was a type of sponge cake. Gorgeous! If you want a bit of theatre, you can order scoops of vanilla ice-cream as a kind of mini-dessert, which are made to order at your table with liquid nitrogen. But, they were £8 a scoop, and more importantly, we were very full, so we decided to skip that! (We saw some being made at the surrounding tables and they looked very cool, but I think we made a better choice by ordering the desserts). We finished off with coffee and tea, and another little sweet surprise. At the end of the meal, we were presented with a little pot of chocolate ganache, served with a crisp caraway seed biscuit - a lovely way to round off the meal. The inclusion of caraway was, for me, unusual, but very welcome. And a reminder that I want to try making seed cake one day! 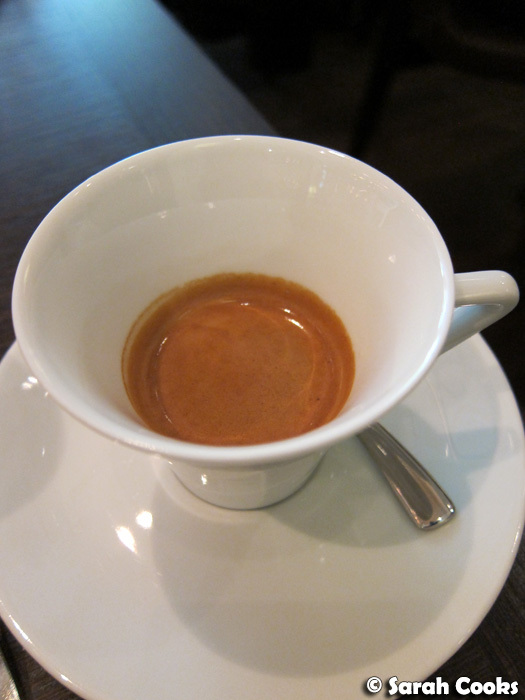 (As read about in Jane Eyre, and in Nigella's Kitchen). So that was lunch at Dinner! We had such a wonderful time, and literally couldn't fault the meal. Absolutely make the time for a visit if you are in London! Thanks for letting us live vicariously through you! I love how detailed the skin of the meat fruit is-pock marked and everything! So jealous! I've been in France for nearly six weeks and I wish now I had planned a trip to London on the way home! Man! One day I will get here...one day! I'm absolutely salivating over the meat fruit, the texture looks so good I feel like I could almost feel it in my mouth! Haha. omg i've always wanted to try that meat fruit just to admire it's beauty beforehand! 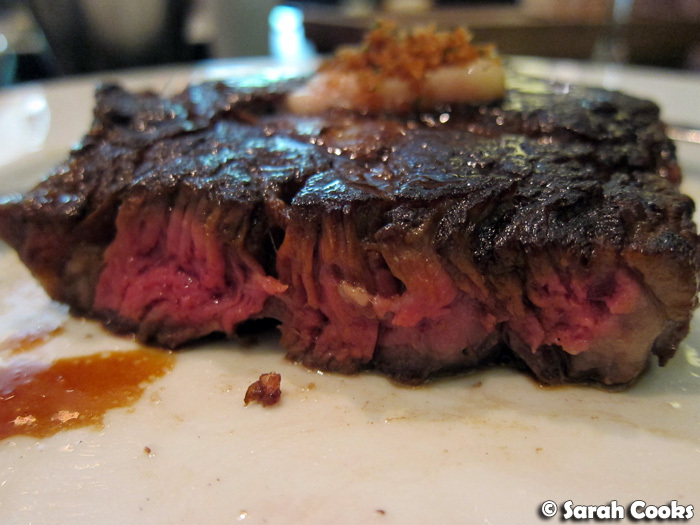 The steak looks amazing too - the simplest things are often the hardest to do, and impress!